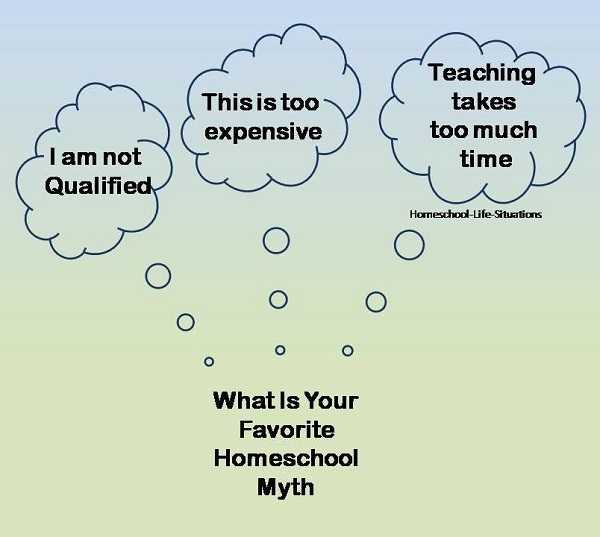 I think one reason that people believe homeschooling myths is that there is some truth to each concern. Some people do fail at teaching their children. Some children don’t learn. Those who fail are in the minority. Maybe they didn’t look at ways to correct the problems with educating their children. Maybe if the child had gone to school he still would not have learned. It is hard to say because we are all unique. The statistics show that homeschooling is a good way to teach children. So we can either believe the myths or find solutions to overcome our fears. Here are some of the concerns people have. You will need to check out your state’s homeschool laws before you start. Most of the qualifications are easy to obtain. Get help if you don’t understand a subject. Learn along with your child. You could use scripted teaching manuals or manuals with detailed solutions to problems. Another idea is to watch teaching videos. Books and other educational materials can cost a lot. There are ways that you can save money. There is a section on my website about how to cut the cost of homeschooling. You will learn how to use the library and internet to save money. Many parents believe that the best education is provided with the latest technology. Technology is nice but it is not education. Our children need to learn how to think. There will always be new technology. If our children can think they may even be the ones to develop the new gadget. There are parents that homeschool children who have special needs.The National Challenged Homeschoolers Associated Network (NATHHAN) can help you learn how to teach your child. Because you are teaching one-on-one your child can accomplish more in a shorter period of time than at school. You will need to set time aside for reading instruction, math, writing, science, and history. In our family we believe that learning is part of life. So our schooling goes beyond formal school time to include field trips, chores, cooking, reading, and crafts. Some parents feel that they can’t teach because they have babies and preschoolers in the home. It is possible. I taught difficult subjects when the baby was sleeping. Other times we had the baby and preschoolers in the same room playing quietly. Another idea is to have one child play with the baby while you teach another child. Sometimes having a job is more important than teaching. We can still homeschool. One way is to work from home. Another way is to teach when you are home or dad could teach. If your children are independent and old enough you could use an online program or computer program. There are several homeschooling myths about teens, graduation, and college. Most are not true. Today many homeschoolers have attended college. I had a friend whose child attended a university at sixteen. I also have known a lot of homeschooled teenagers who have attended a community college and received high school and college credits. Many homeschool graduates have jobs. Many start their careers at a young age. There have been rare companies that refuse to hire people who were educated at home. If this happens you can look for a similar company. If you really want to work for a company see what their policy is before you apply. If you need a college degree get one. Another option is getting the GED. There are ways to get around teaching high school math and science. One your child could take the classes from a co-op or community college. Or you could learn the subject along with your child. There are also high school video classes for math. Homeschool children usually are well socialized. They can communicate with those older and younger than them. One thing that homeschoolers have difficulty with is deadlines. We can always tell our children when we expect assignments done. Read more about some of the fun activities that families do to be socialized. There will probably be homeschooling myths until we stop teaching our children at home. For every excuse there is usually a solution.